Superheroes can teach us a lot in life. They show us how to protect ourselves, value others, and defeat evil. However, Superman isn’t around to save you every day, so being able to stand by yourself and your own beliefs is important. 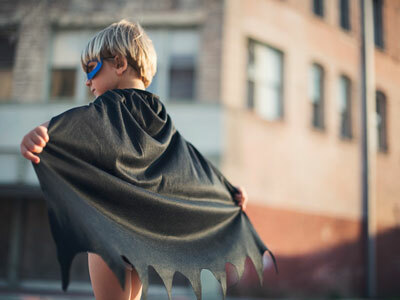 John Pavlovitz, author of HOPE AND OTHER SUPERPOWERS, shares his advice on how to empower yourself, while being your own superhero. Identity is at the core of self-protection: being able to differentiate between you and the things people think and say about you. Too many ordinary heroes succumb to defeat or conflict when they allow their critics and adversaries to define them. I’ve often said that if hell exists, it will look a lot like a blog comments section, and early in my journey as a public figure I regularly found myself either morose or furious because of the hateful and demeaning words people addressed to me. It took me a while to realize I didn’t have to accept delivery, to remind myself that those commentators were operating with incomplete information about me, so I needn’t believe their words as gospel. This isn’t just true of online trolls either. No one around you really knows you fully, so refuse to let anyone—not a boss or a family member or a spouse or a former friend—tell you who you are. When you know who you are, you make it much more difficult for people who assume they can define you. In Marvel’s blockbuster Black Panther, the titular hero, T’Challa, has an energized suit of interactive metal designed by his tech mastermind sister, Shuri. One of the suit’s major upgrades from previous film iterations is its ability to capture and store kinetic energy and then release it when needed. As bullets and body blows strike the suit, they actually strengthen it. T’Challa is able to take everything his enemies throw at him over time and respond to it in one powerful, redemptive act of resistance. This is how you can save the world and save yourself at the same time: by taking every vicious attack, every hateful diatribe, every improperly ascribed motive and letting it fuel your activism and reinforce your character. In practical terms, that simply means that rather than meeting someone’s cruelty with direct opposition (an online adversary, a corrupt politician, a manipulative friend, an antagonistic coworker), you channel that cruelty into measurable work elsewhere that makes the world less cruel. Or instead of allowing the lack of compassion you encounter in the world to seep into your heart and weigh you down with a crippling despair, you find a way to tangibly make the world more compassionate through acts of service, and you find hope in the way that you’re tipping the scales from enmity to love. Every hero needs a rest. Superman retreats to his Fortress of Solitude, Batman sits fireside at stately Wayne Manor, and Wonder Woman rests on the shoreline cliffs of Themyscira. You need to regularly step away from the noise and conflict to recharge your body and recalibrate your brain; to find a place to be still and silent and have your magnified threats rightsized again. Part of developing a good defense system is knowing that you can’t always be in the fight. Sometimes you have to pause the world-saving work and do whatever it is that brings you peace and gives you life, whether that means taking time to meditate or exercise, grabbing a nap at the park, calling up a friend for lunch, or lying on the grass and feeling yourself exhale fully. This is the two step dance of engaging and withdrawing. Pick up a copy of HOPE AND OTHER SUPERPOWERS by John Pavlovitz for more advice on how you can be your own superhero! Excerpted from Hope and Other Superpowers by John Pavlovitz. Copyright © 2018 by author. Used by permission of the publisher. All rights reserved. Photo by TK Hammonds on Unsplash. Overwhelmed by the news cycle and the state of affairs in our world? 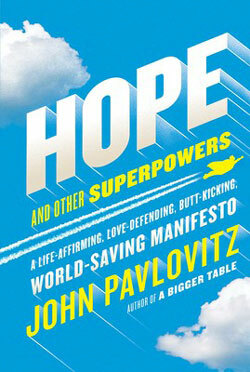 Pastor, blogger, and powerful voice in the Resistance, John Pavlovitz has the answer: this rousing and inspirational guide, drawing from lessons of our favorite superheroes, for how we can band together, live more heroically (and meaningfully) and save the world. It’s exhausting to give a damn these days, isn’t it? Perhaps you’re feeling anguished about what you see on the news or in your social media timeline, or by your personal circumstances, and are paralyzed waiting for political or religious leaders, or celebrities, to rescue us from it all. But what if you didn’t have to wait for someone else? What if you could be the hero?